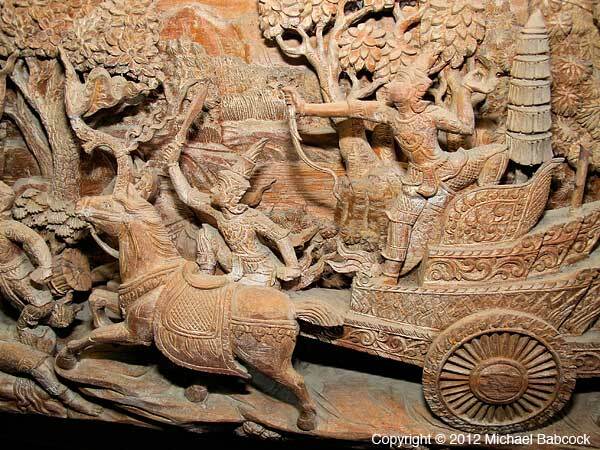 Ban Roi An Phan Yang Museum is a museum devoted to wood carvings. Located in a Lanna-style house on the outskirts of Chiang Mai, it contains astounding examples of what can be done by a master wood carver. 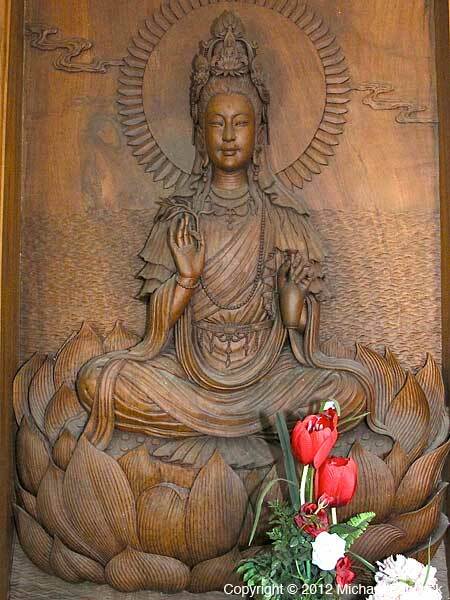 It is well worth a visit. 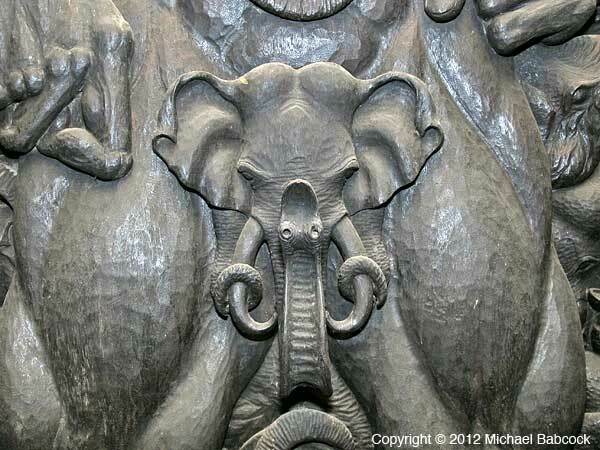 Note: I am going to let the carvings speak for themselves through photographs taken by myself and Kasma in a slideshow at the bottom of the page. 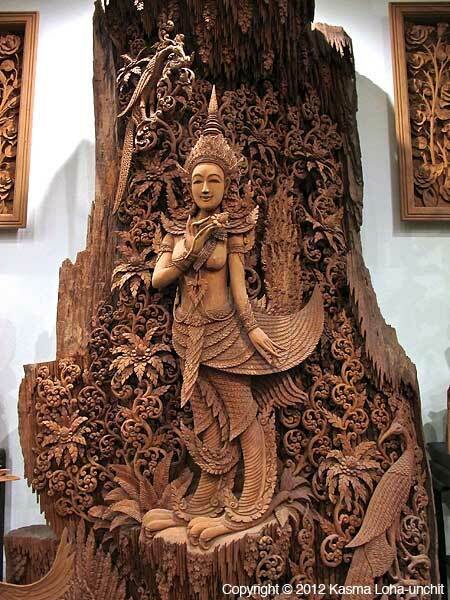 I have made the images 450 x 600 pixels: I apologize to those of you with slow connections but I want the photos to be large enough to do justice to the carvings. 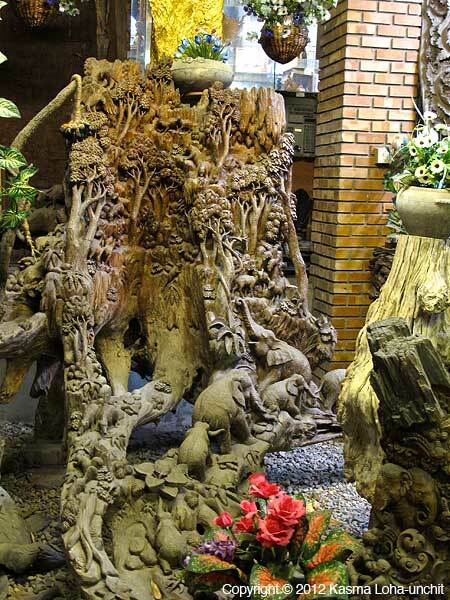 This museum is the labor of love of a Thai man, Charoui Na Soonton, who has collected more than 1,000 wood carvings. 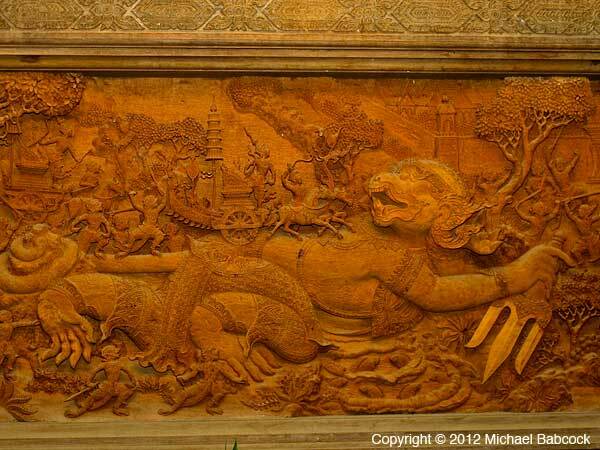 The “museum” is actually his house, a warren-like maze of rooms filled with carvings in all styles, from giant elephants to intricate bas-relief carvings displaying an episode from the Ramakien (the Thai version of the Ramayana). 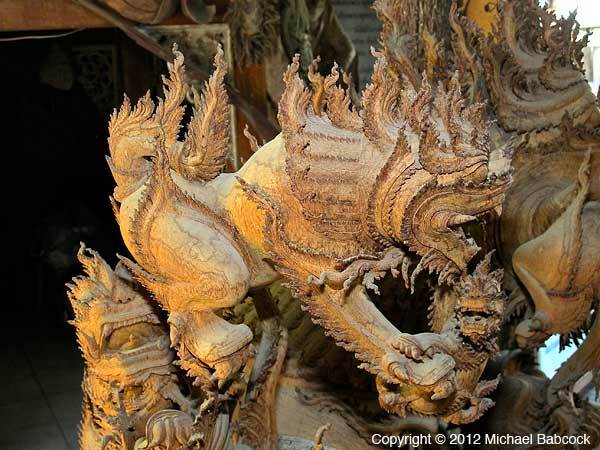 There are Buddha statues, columns with traditional deities elephants, goddesses, demons and more. 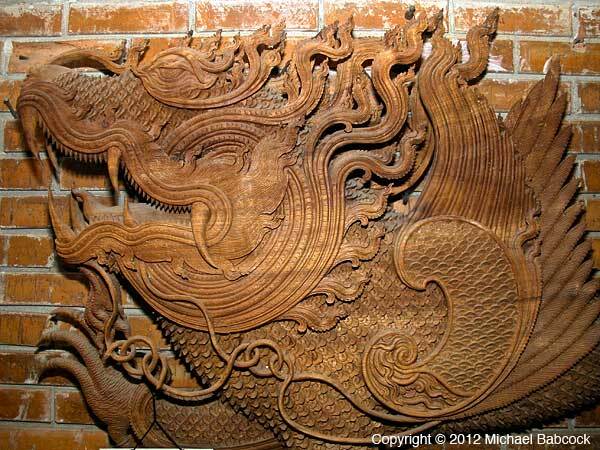 Some of the pieces on the wall are up to 20 feet long and may be up to 6 feet high. The museum (house) is spread out between three or four floors; one of the staircases consists of old, wooden wagon wheels. 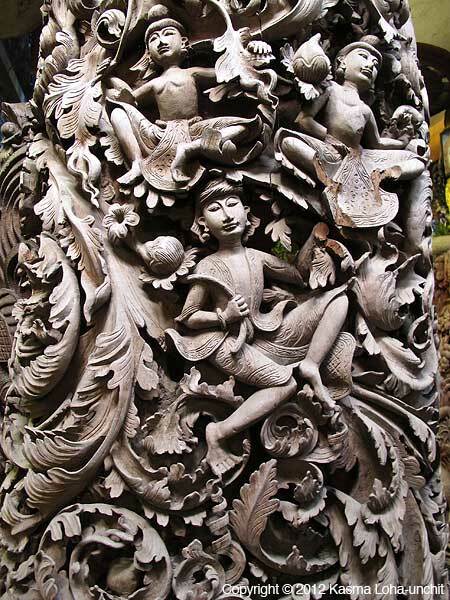 The carvings extend out onto balconies and then into a garden at the back of the house. 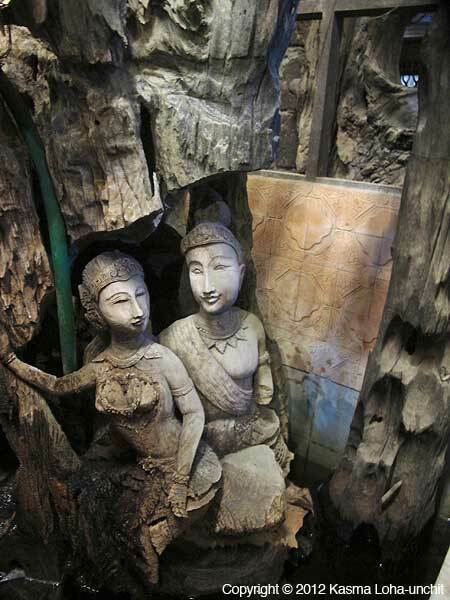 Expect to spend at least an hour wandering through the labyrinth. 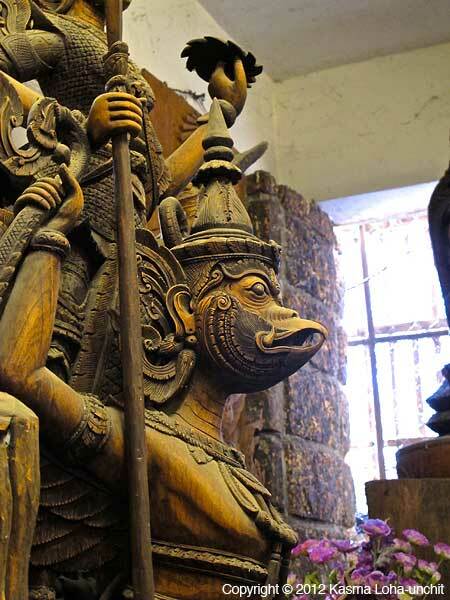 Charoui is a devout Buddhist and there are many altars spread throughout the complex. 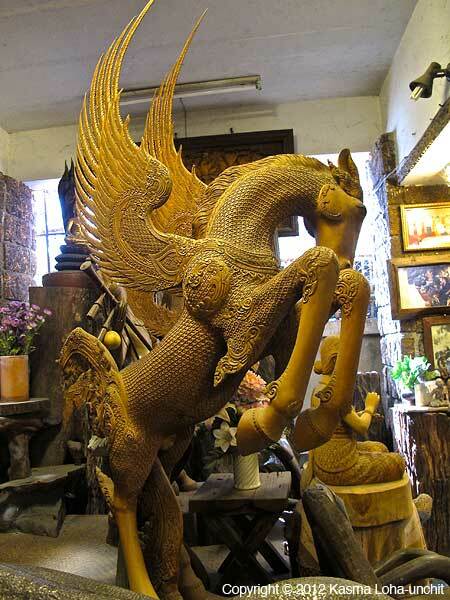 In addition to collecting carvings, Charoui also commissions them from several carvers who are allowed to carve without specific deadlines. 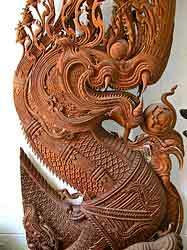 He has scoured the countryside for old wood for use in the carving. It began as a personal collection. It has become a museum because Charoui had exhausted his savings and has opened the museum so that he can get financial support for keeping this priceless collection alive. 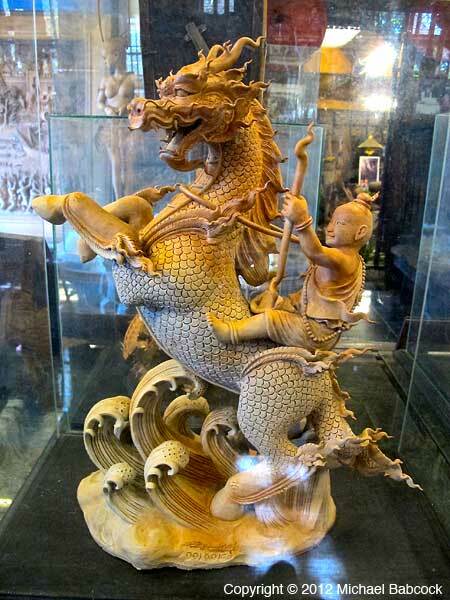 There is also a store where you can buy beautiful carvings. 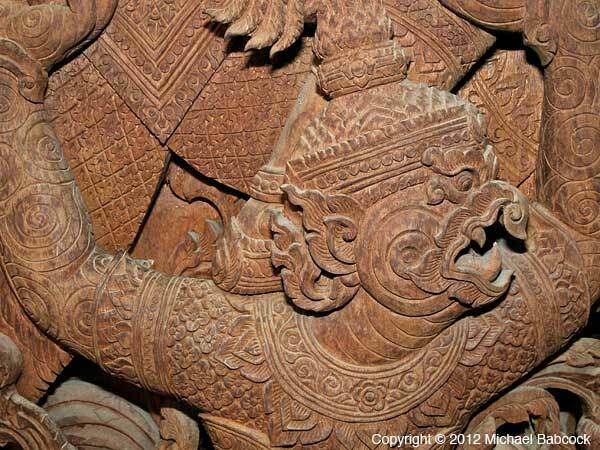 One thing that the photos can not show, is the incredible delicacy, layering and intricacy of some of the carvings. 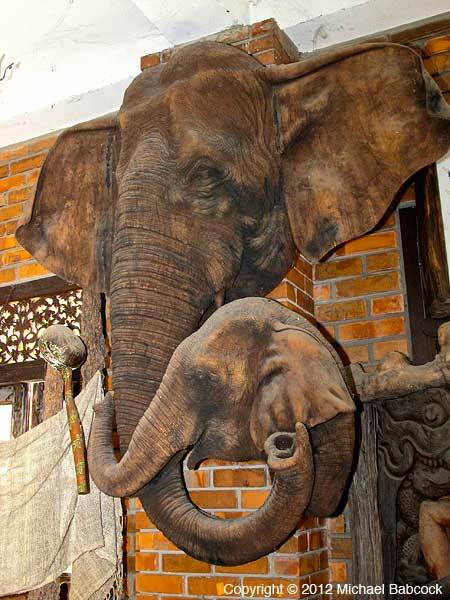 Essentially, it is located on Chiang Mai-Sanpatong Road between kilometers 19 and 20. 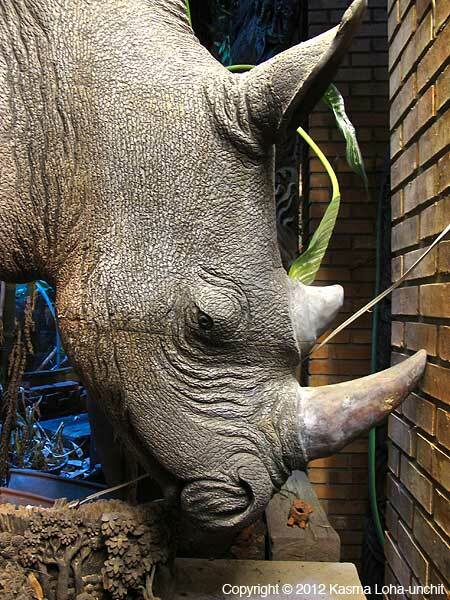 It is open from 8:30 a.m. to 4:30 p.m. daily. There is a requested donation. Also see How to Get There. 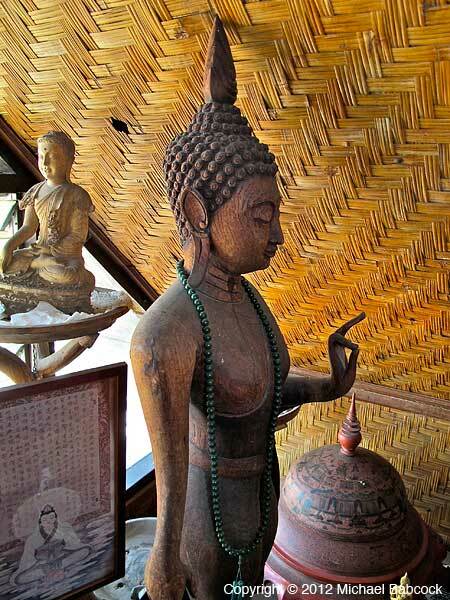 Kasma visits this museum with two of her off-the-beaten track, small-group trips to Thailand – Trip B. 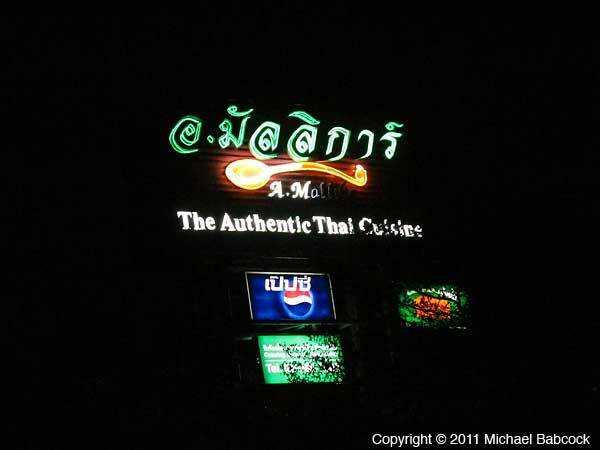 A. Mallika is one of our favorite Bangkok restaurants. 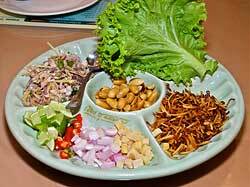 The food in Thailand is, of course, one of the main attractions of the country. 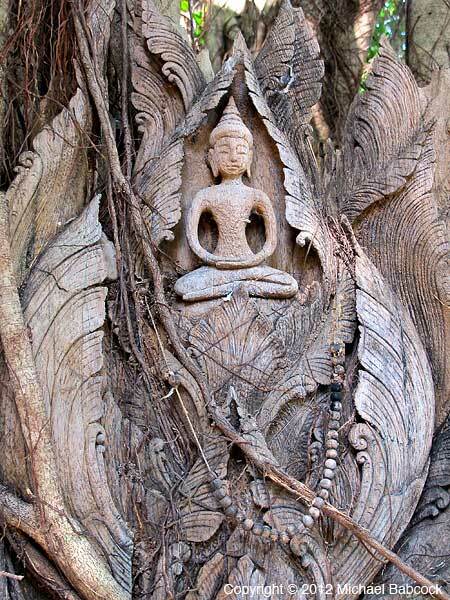 Kasma takes most of her small-group tours to Thailand to A. Mallika for one of their first in-country meals and the food is always spectacularly good. There are two options for seating at A. Mallika. There’s an outdoor seating area with a pond under a large tree with potted plants decorating the area. 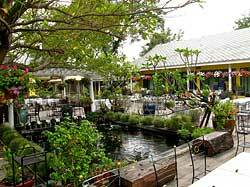 It’s an attractive area but we usually opt to sit inside because we typically are at A. Mallika for lunch and in the middle of the day it can be quite warm outside. There are a number of different rooms indoors, including the room above, which has many tables, as well as private (air-conditioned) rooms, which is where we often eat with Kasma’s tour groups. 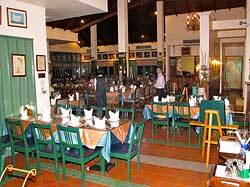 The restaurant can get very crowded, particularly on weekend nights, so reservations are a good idea. The food at A. Mallika is really quite good, both in presentation and in taste. Here are some of the different dishes frequently ordered by Kasma. 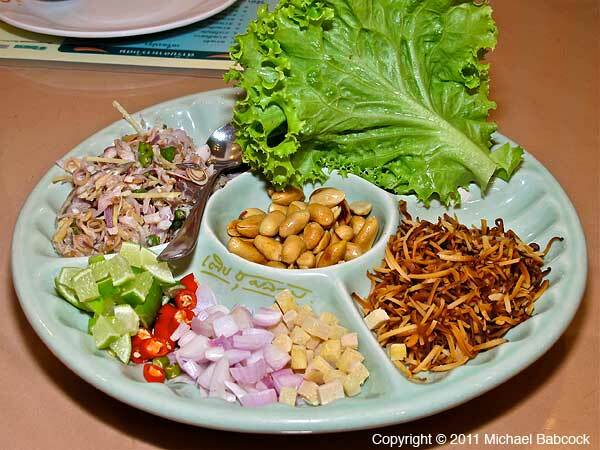 One of the dishes Kasma always starts a group with is เมี่ยงปลาทู (Miang Pla Too): Tasty tidbits and a hot-and-sour mackerel salad are wrapped with lettuce leaves and eaten like เมี่ยงคำ (Miang Kum). It’s a fun appetizier, one that you assemble yourself by placing each of the individual ingredients into a leaf, wrapping them all up into a ball and then popping the whole thing into your mouth; the pleasure comes from the delightful explosion of flavors from all the various ingredients. The second appetizer that Kasma orders is ขนมครก (Kanom Krok) – Grilled Coconut-Rice Hot Cakes. Although these are usually made as a street food, many restaurants also have them on the menu. On Kasma’s trips to Thailand, we seldom miss an opportunity to sample some of these delightfully delicious snacks. Here they are made with green onions (scallions) giving a savory edge to the snack. 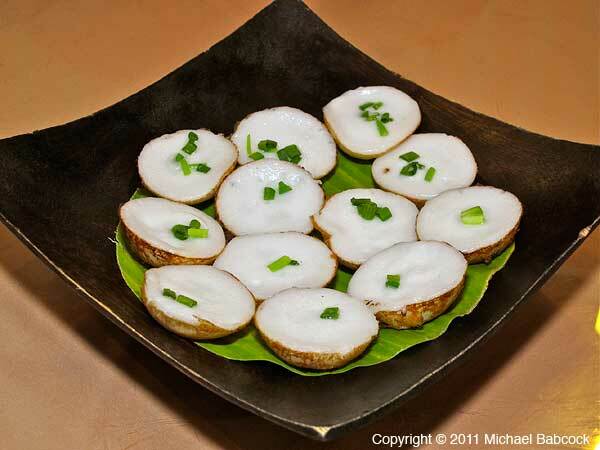 Kanom Krok are typically made with two batters: the lower batter is mostly sweet and the top batter, less of which is added, is salty giving two contrasting flavors to tickle the palate. Kasma always orders the dish in the upper left-hand picture – it’s Ostrich Stir-Fried with Holy Basil. Although it looks like beef, and tastes a bit like beef, it is definitely ostrich prepared ผัดกะเพรา (pad kaprao) – stir-fried with holy basil. It’s a spicy, flavorful dish. Wonderful. 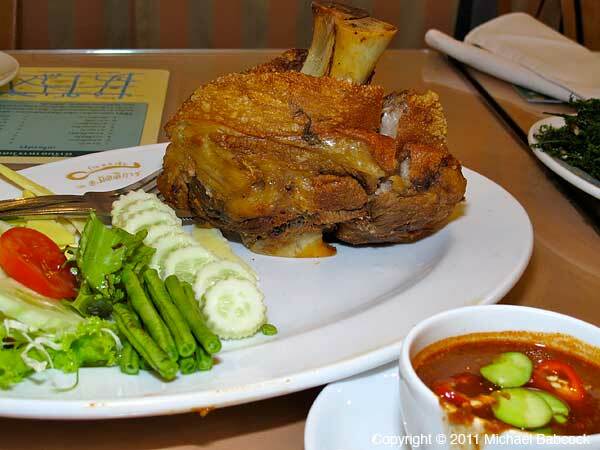 It’s very hard to pass up ordering the dish on the right – Crispy-Fried Stewed Pork Leg. 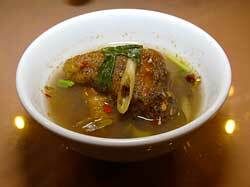 First a pork-leg, complete with skin on, is stewed to tenderness. It’s then deep-fried so that the outside is crispy and the fat just next to the skin is somewhat caramelized. It is very delicious. 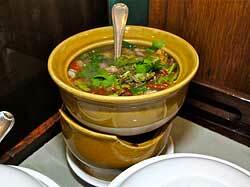 Above we see a delicious a ต้มยำ (Tom Yum) – Hot-and-Sour Soup. Very spicy and full of delicious Thai herbs. 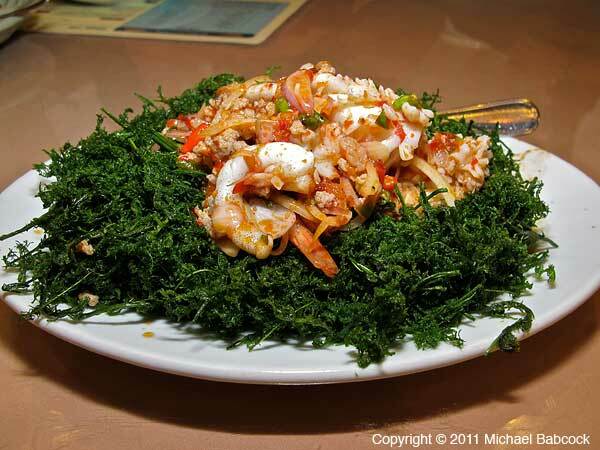 To the left above we see A delicious salad of deep-fried cha-om (a kind of edible tropical acacia), topped with a seafood and chopped pork sauce. 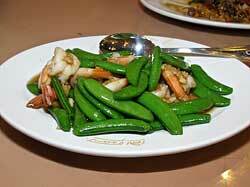 It’s spicy, sour and somewhat sweet with the deep-fried green providing an interesting texture. Very delicious. To the right we see one of our favorite vegetable dishes Stir-fried Vegetables with Oyster Sauce – ผักผัดน้ำมันหอย (Pad Pak Nam Mon Hoi), what I think of as The Universal Vegetable Recipe. We definitely recommend that you leave space for the Coconut Ice Cream – ไอศครีมมะพร้าว (Ai Kreme Maprao) at the end of the meal. 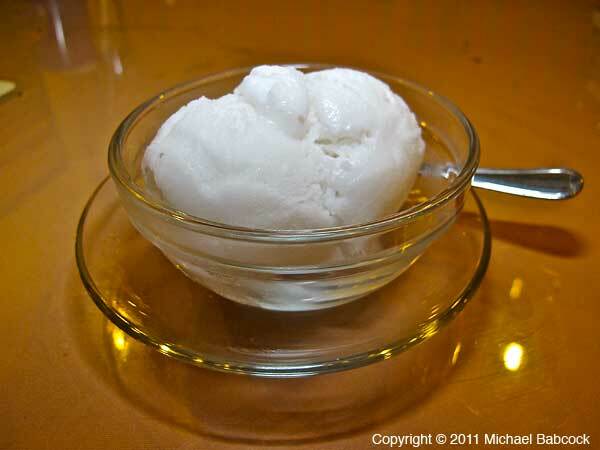 It’s more like a sorbet and is tasty and refreshing, a great way to end a meal. If you’re particularly hungry (hard to imagine after all that delicious food! 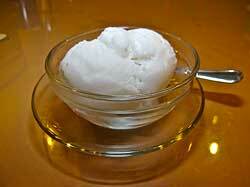 ), you can get a larger portion that comes served in a young coconut shell. It’s not the easiest restaurant to get to. It’s a bit on the outskirts of town and it is easiest to get to if you are able to drive or be driven. You may want to check out the Google Map for A. Mallika. 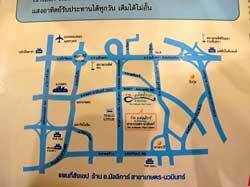 There is a sister restaurant run by the same people: Ruen Mallika Royal Thai Cuisine at 189 Soi Sukhumvit 20, Sukhumvit Road, Klongtoey, Klongtoey, Bangkok 10110. It’s a fancier place with excellent food and is a bit more accessible to central Bangkok. 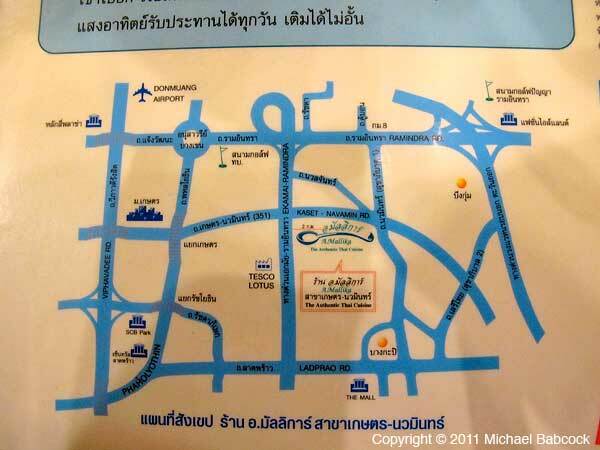 If you go there, we recommend you print out the map from their website – it can be a bit hard to find. 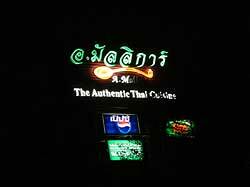 We previously talked about A. Mallika in our post Favorite Bangkok Restaurants. Here are some more photos found in our Facebook album for A. Mallika. Food Photos of A. Mallika by a member of Kasma’s trip to southern Thailand. 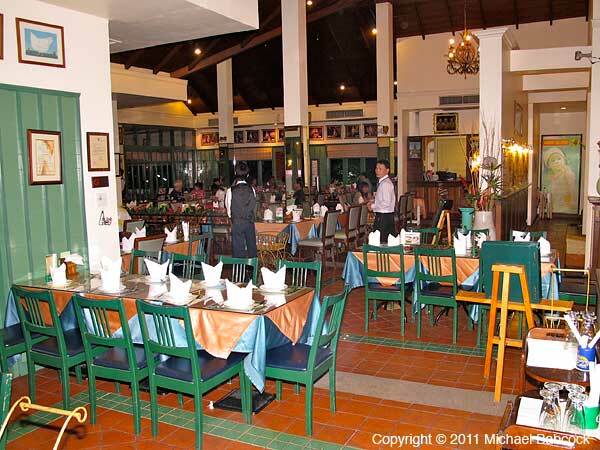 Website for Ruen Mallika, the elegant sister restaurant on Sukhumvit Soi 22. 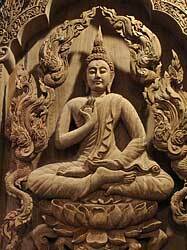 Here’s the link to Kasma’s Small-group Trips to Thailand. 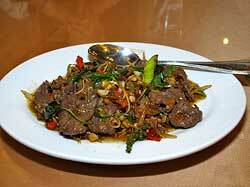 You are currently browsing the Thai Food and Travel Blog blog archives for December, 2012.